[dropcap]O[/dropcap]h boy, does this really take me back! The highly popular digital pets known as Tamagotchi from the ’90s and early 2000s are making a comeback. As part of the 20th Anniversary last year, Bandai America decided to re-release the trendy toys in limited edition mini variations. The miniature Tamagotchi versions feature their familiar egg-shape as well as the pixelated LCD screen where the pet does a majority of it’s roaming. At its core, a Tamagotchi is all about nurturing. The digital pet relies on you to feed, clean and play with them. They were portable and highly addictive to play with. So, naturally during their initial re-release Tamagotchis just flew off the shelves! Since the 20th anniversary of Tamagotchi, we received an overwhelming demand from fans to bring the devices back…By releasing the mini Tamagotchi in these cool colors and new textures, we’re able to reach new fans that come to love nurturing play of Tamagotchi, while also giving existing fans what they’ve been clamoring for – more to add to their collection. 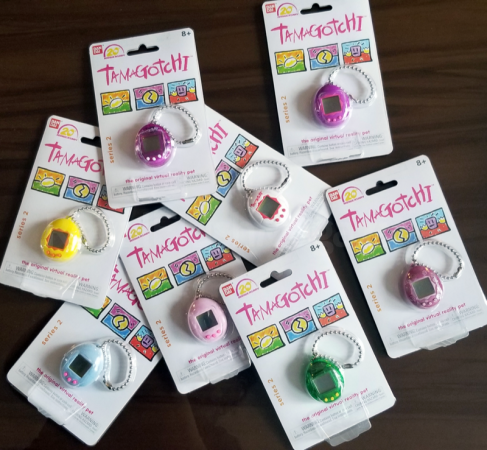 The limited edition mini Tamagotchi collectibles are available now for pre-order in the six exclusive colors from the ’90s U.S launch as well as two new flocked versions—baby pink and baby blue. The flocked versions have a soft velvet cover. Each version is available for only $14.99. This is a new opportunity for anyone that might have missed out on the initial release last November. Bandai builds on dreams, adds to the fun, and strives to inspire kids of all ages around the world, every day! A leader in developing engaging, quality toys that capture children’s imaginative spirit and provide endless “Fun For The Future,” Bandai America Incorporated is the manufacturer and master toy licensee of some of the most popular brands in children’s toys and interactive entertainment today. The Bandai America brand family includes Power Rangers®, Dragon Ball®, Miraculous™ and Zak Storm™, among other boys, girls, preschool, and hobby product lines. Bandai America Incorporated is a subsidiary of BANDAI NAMCO Holdings USA Inc., an entity that resulted from the integration of Namco Ltd. and Bandai Co. Ltd. of Japan. Global interests encompass three strategic business units: Toys and Hobby, Video Games and Online Entertainment and Film and Music. The company is headquartered in El Segundo, California. Find out more about their expertise in connecting with kids in fun and fresh ways at www.bandai.com.